When I’m running a Managing Difficult People seminar, I ask the participants to make a list of pet peeves that they have about other people. Some of the participants are reluctant to admit their pet peeves. They believe they shouldn’t have any, or they’re too embarrassed to admit to them. With a bit of encouragement from me, and some of the more outspoken members of the group, we eventually end up with a huge list on the flip chart. As you will see, the list goes on and on. Once we have all these pet peeves on our flip chart, I then ask the group to vote on each one. In a group of, let’s say, 20 people; 12 people might say ‘speaking with your mouth full’ is a pet peeve for them. Another 6 people might say ‘untidiness’ is a peeve for them. What comes out of this, as you will see, is that not all of us have the same pet peeves. If you consistently arrive late, this can drive some people crazy, while others don’t really care if you’re late or not. Most of these pet peeves come from your programs of behavior. You probably learned them from your parents and the people you grew up with. When I was a child, I was never allowed to waste food. I had to eat everything that was on my plate before I could leave the table. This programming is so strong, that as an adult I admit to being a bit peeved by people who pick at their food and leave lots on the plate without eating it. When we interact with other people it is highly possible that we allow our pet peeves to influence that interaction. I was running a seminar for some bank employees and several of them stated the same pet peeve. They hate when a customer answers their mobile phone in the middle of a transaction or a conversation. Because the bank employee finds this behavior annoying, it could potentially affect how he or she deals with the customer. The staff member’s annoyance, albeit slight, maybe transmitted to a customer by tone of voice or body language. It is then possible that the customer may become difficult. Any person’s behavior, which is a pet peeve for you, may hook you into behaving in a way that will potentially cause problems. We all have pet peeves about other people. However, if we allow these to influence our behavior, then we will only make dealing with people much more difficult. 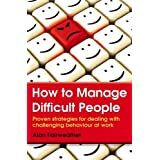 This entry was posted in communication, difficult people, motivation and tagged Alan Fairweather, Behavior, Body language, communication, confidence, customer service, difficult people, Motivation, motivational speaker, Thinking. Bookmark the permalink.